A mystery set in March 1904. As the wedding music starts, the bride begins her long walk to the arms of her groom. But she will not finish the journey. The beautiful bride emerges stunned, blood on her dress. She stands alone, blood dripping from a dagger at her fingertips. 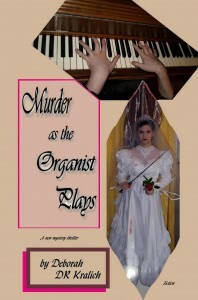 Unknowing, his back to this scenario, the organist plays on… The processional music is the soundtrack for the murder that shatters the wedding day. The celebrated political socialite goes from bride to victim to suspect in a matter of hours. Only one man, flamboyant and mysterious, stands between her and a noose or an asylum in this 1900s high society mystery thriller where political intrigue complicates all efforts to discern the truth. Turn of the Century picturesque East Texas is the setting for this mystery thriller with historical aspects. What happens next takes the reader on an exciting journey of mystery, love and suspense with a completely twisted ending.